After a very volatile week US markets stabilized a bit on Friday. The Nasdaq ended the recent lunar green period with an 80 point loss, making it the weakest green period since January. Is this weakness set to continue in the current lunar red period? 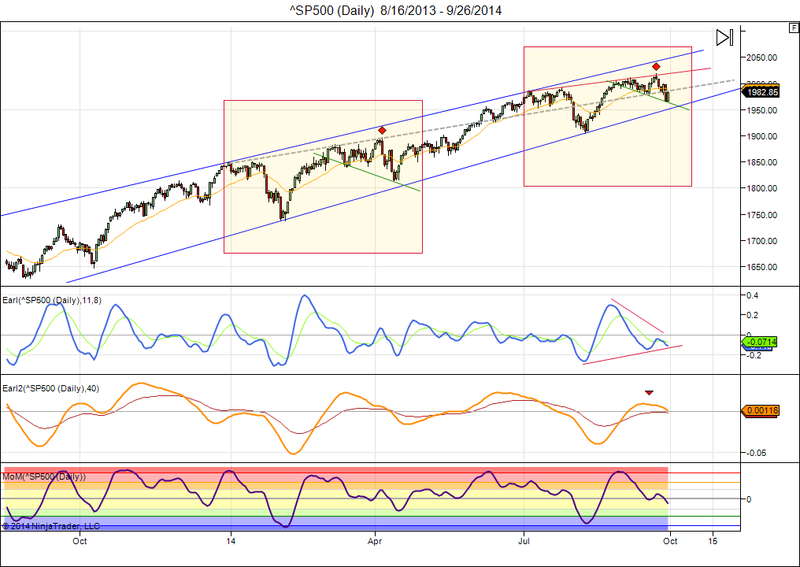 The recent market action in the S&P 500 is eerily similar to the first 3.5 months of the year (red boxes in the chart). In April this led to a 10% rally in the next 2 months. Are we setting up for a similar outcome? Maybe, maybe not. We have to watch the support and resistance levels very carefully. A drop below 1950 would clearly tell us that we are in a different scenario. Technically, all my indicators are pointing down right now, and my weekly key reversal levels are also flashing warnings. So, until some of these indicators turn up I would stay very cautious. We are at a high risk point in the market. This entry was posted on September 29, 2014 at 8:04 am	and is filed under Financial Astrology, Market Commentary. Tagged: lunar cycles. You can follow any responses to this entry through the RSS 2.0 feed. You can leave a response, or trackback from your own site.